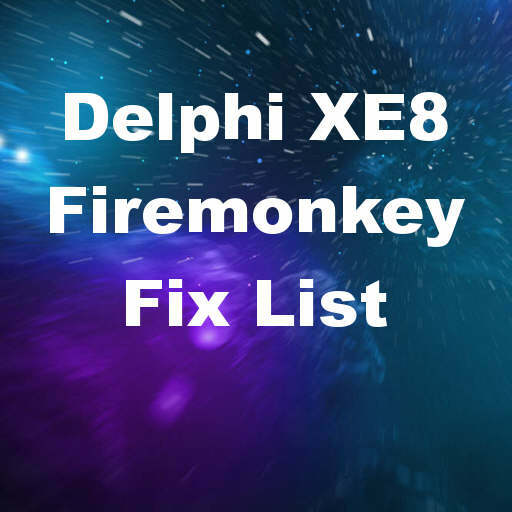 The Delphi XE8 bug fix list for the bugs which have been fixed since Dephi XE7 is now available and there is some great stuff in there for Firemonkey. There are over 350 fixes in the list for all four Firemonkey platforms (Windows, IOS, OSX, and Android). I’ve highlighted some below which I think will have affected developers the most based on memory fix, speed fix, visual fix, functionality fix, etc..
Head over to the Embarcadero Developer Network and check out the full list of over 350+ fixes.